Imagine a teenage girl strolling with her father through a park. Suddenly noticing a tiny creature whose mother was killed by reckless children some time before, the girl asks her father whether she could take the creature home and keep it as a pet. As the child plays with the little creature, feeding it and keeping it safe. She watches it grow before her eyes, seeing it become a burden with its’ increasing rebelliousness and its’ refusal to wear the tiny costumes made for it. 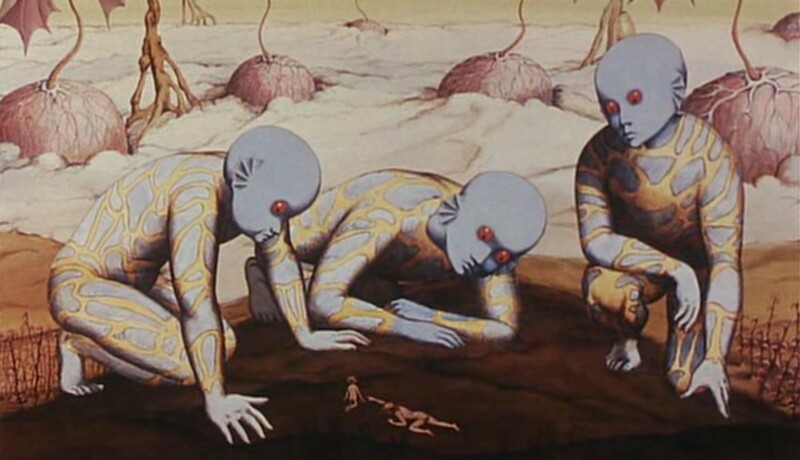 The premise is one seen in any human interaction with animals, but this is also the starting premise of one of the great art pieces in the history of cinema, of René Laloux’s Fantastic Planet. The girl in question belongs to a race of blue-skinned giants named Draag, while the helpless creature, named Terr, is in fact-a human child, who are named in the film as Om (after the French homme). Due to its’ unusual visual style, the film was mostly shunned stateside, and the majority audience never got the chance to grasp the deeper symbolism hidden between the shots of this masterpiece. Before we enter the intricacies of this majestic work, let us start with the foundations. 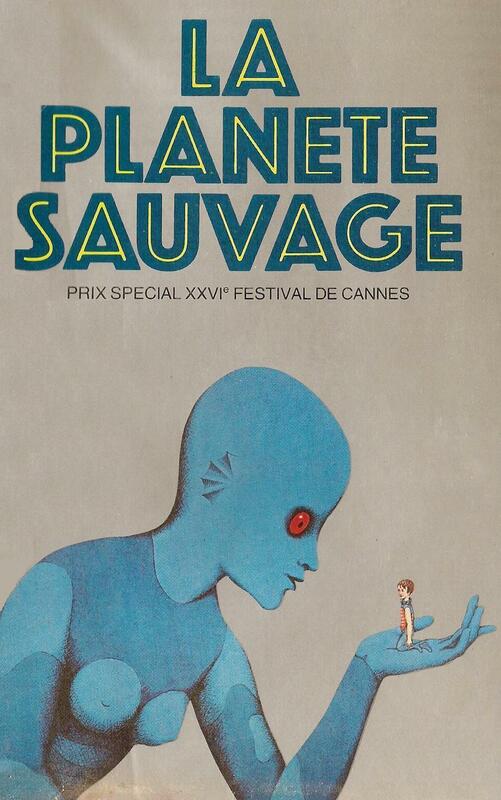 La Planète Sauvage, translated the Fantastic Planet, or Savage Planet, which would be an even better translation, is a cutout stop-motion allegorical film created in 1973, as a result of a co-production by France and Czechoslovakia, and later distributed to the United States by the great Roger Corman. 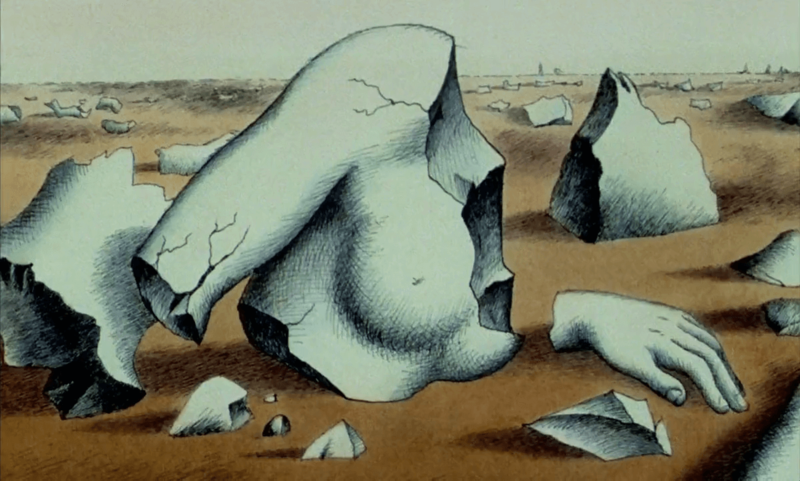 One of the first things that come up while watching the film is its’ distinct visual solution, based on cut-outs, such as we have often seen in Terry Gilliam animations. This combined with Roland Topor’s incredible mise en scène gives us a ride we have never seen before, one of an incredibly bizarre children’s book come to life. Seeing human lives extinguished as those of rodents disorients us and gives us a surrealistic impression of a space best described as Daliesque. This method is in fact very important for the narrative, given that the whole film attempts to reverse the perception of the viewer and show how fragile the position of humanity actually is in the grand scheme of things. Why I mention this is because animated films (not speaking of commercial American and Japanese productions, mind you) in general cause an interplay between the authors and the viewer which does not require the usual Coleridge’s suspension of disbelief, but actually draw the viewer into testing his or her own boundaries of perception in many ways. This is what this film attempts, and succeeds. Due to its’ unusual visual style, the film was mostly shunned stateside, and the majority audience never got the chance to grasp the deeper symbolism hidden between the shots of this masterpiece. Despite its’ humble commercial success, the film was praised by critics and quickly developed a cult following. The Oms have destroyed their home planet, reducing themselves to a tribal existence on the planet Yon. Many of them enslaved by the Draag, they live in the Park, while the ones that managed to escape this fate live in the wasteland outside the city walls. The film follows the boy, Terr, through his upbringing in the household of the Grand Master of the Draags, to his adolescence and the discovery of his rebellious nature. His caretaker, the girl Tiva, does her schoolwork by absorbing huge quantities of information telepathically through a sort of a headset device, and she allows Terr to participate in these sessions. These lessons on the ways of nature act as a trigger in Terr, causing him to question evermore and to consequently attempt to escape from his position and find other humans on this mysterious satellite of the planet Ygam. In an unusual twist, the Om age much faster than the Draag, and we witness the growth of Terr from a baby to adolescence in less than a season for the blue skinned aliens. When Terr manages to find a way out of the Draag city, he finds himself faced with a strange wilderness inhabited by vast deserts and dangerous predators lurking everywhere. He consequently finds a Stone Age village of Oms and shares his breadth of knowledge with them, becoming their leader. Through this exchange of knowledge, we find out that the Draag are conducting so-called “de-Om” anti-pest campaigns, which show a brutal, but not an evil intent from the side of the Draag. The Draag seem like an evolved kind of human, a meditative and emotionally distant species, they act in an amoral fashion. On the other hand, the Om, often overwhelmed with negative emotions and bickering, almost feel as if they deserve their fate. With this unusual narrative structure the classic dichotomy of good versus evil is transcended, leading to the transference of empathy to both sides at different times. Created with a huge amount of passion, with grounding in politics and ideology, the realization of the film ascends us to the world of dreams, and gives us a reviewing value like none other. The Oms have destroyed their home planet, reducing themselves to a tribal existence on the planet Yon. Many of them enslaved by the Draag, they live in the Park, while the ones that managed to escape this fate live in the wasteland outside the city walls. The first scene of the film sho ws Tiva and her father, the leader of the Draag saving and adopting Terr, as the Pharaoh’s daughter found little Moses and raised him. There are many Eastern, or even Israelite mystical elements, such as Terr’s education, where he finds Gnosis, forcing him to leave the Garden of Eden, but opening him the doors to a quest for higher spirituality. The film opens many doors for interpretation, but at least some of them can be answered by looking at the time when the film was created. With the collapse of the counter-culture in the late sixties, this film came out as an utopist vision of the ragged and dissenting Om, although disorganized in their discontent, which attempt to fight the industrial civilization that attempts to subdue them. On the other hand, if one sees the film through the eyes of the existentialists during the Cold War, the film functions as a cautionary tale of how our anthropocentrism is a fleeting thing, how quick are harsh lessons in humility. 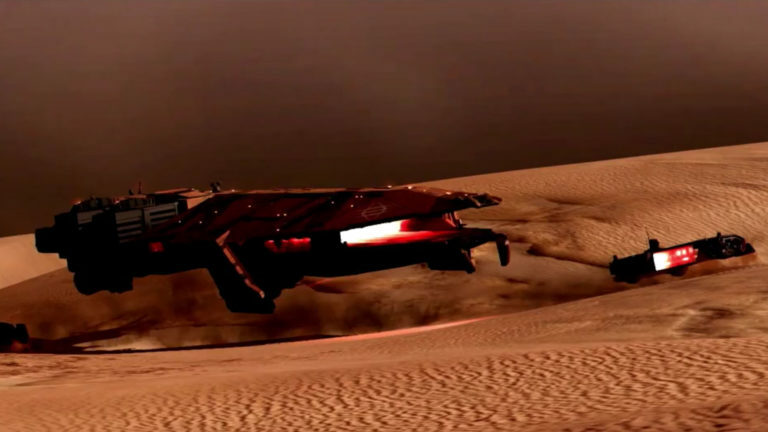 Even the color spectrum of the film ascribes the color blue to the higher level of consciousness to the Draag, and their allegiance to the Savage Planet. On the other hand, the world of the tiny Om looks much more corporeal, reminding the viewer of the bizarre insides of the human anatomy, where the color red represents the color of fear. No matter how we attempt to deconstruct the ideas behind the film, all of them fall short of the genius that is this strange and compelling work of animation. Created with a huge amount of passion, with grounding in politics and ideology, the realization of the film ascends us to the world of dreams, and gives us a reviewing value like none other.